❂ Betta species prefer a warmer water climate than other tropical fish - around 25-30°C (77-86°). They have an organ known as the labyrinth organ which allows them to breathe air at the water's surface. This organ was thought to allow the fish to be kept in unmaintained aquaria, but this is a misconception, as poor water quality makes all tropical fish, including Betta splendens, more susceptible to diseases such as fin rot. ❂ Average Bettas live around 2-3 years, they can live as long as 9 years when the water conditions are good and they go through regular exercise. This is an extremely long life span compared to other fish species. 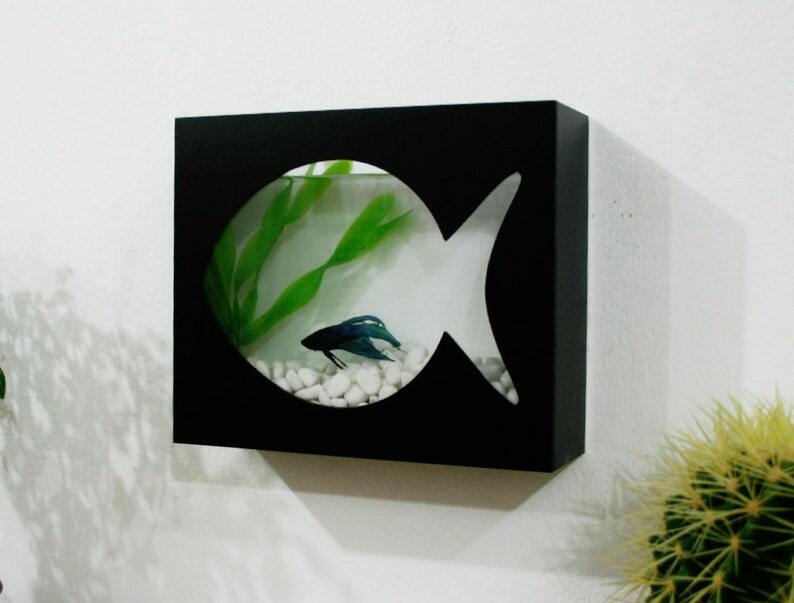 ❂ Your Bettas must be fed with small but frequent meals. Their stomach size is equal to that of an eyeball and the best feeding schedule is to offer it food twice a day. Pet Bettas literally beg for food when they see anybody nearby. ❂ Betta fish are low maintenance and easy to care for making them the perfect starter fish for kids! ❂ I can ship your order to any address if you are buying it as a gift. I will also include a wish card with your note on it. ❂ I would love to hear your own ideas or your custom requests. Very slow shipping, but other than that, item was as described. Nice quality and so far looks good. Article sympathique mais cher . Il n'est pas arrivé à temps pour Noël malgré les informations données. Fantastic product with a stylish design. Great mix of concrete, wood, and metal. Sol was super to work with on our custom order and we get lots of compliments from our patients about our room number signs. This is a quality item, excellently crafted and well packaged for delivery. I highly recommend this seller ! I want all our customers to be happy with their products. Therefore I ask that you contact us with any concern about your product and we will be more than happy to work with you. Note that these are estimated guesses according to past experience. Unfortunately this depends on the post office services and they can't give us any more accurate estimates. Once your item is shipped you will be sent a message on Etsy with your item's tracking number and details on how to properly track your item. Keep in mind that post office services are usually slower during big holidays like Christmas due to increased traffic. We want all our customers to be happy with their products. Therefore we ask that you contact us with any concern about your product and we will be more than happy to work with you.